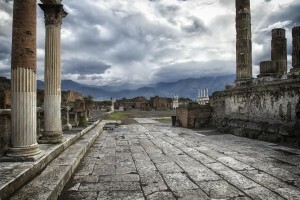 With the recent release (and subsequent flop) of the movie Pompeii starring Game of Throne’s Kit Harington, the interest in the ancient Roman city and movie’s namesake has erupted like Mount Vesuvius, and for good reason. The city of Pompeii has a troubled, yet incredibly interesting past, which is one of the many reasons it has become a popular stop during our Discount Italian Vacations and attracts nearly 2.6 million visitors annually. Situated near Naples in the Italian region of Campania, the city of Pompeii, along with lesser-known Herculaneum, was mostly destroyed and buried by ash during the eruption of Mount Vesuvius in 79 AD and lost for nearly 1,500 years. Pompeii was not rediscovered until 1599. And it was not until 1748 that Spanish military engineer Rocque Joaquin de Alcubierre began excavations. Researchers believe the city of Pompeii was founded somewhere in the seventh or sixth century BC, although the site had already been in use as a safe port by both Greek and Phoenician sailors for years. Over the years, the city exchanged hands several times (Etruscans, Samnits, and Greeks) before finally being captured by the Romans in 80 BC. Pompeii became an important Roman port, a passageway for goods that arrived by sea and had to be sent to Rome along the Appian Way. The infamous eruption of Mount Vesuvius occurred on the 24th of August, 79 AD. The city of Pompeii was completely destroyed and its inhabitants lost, while neighboring cities, most notably Herculaneum, also suffered immense damage. Most of Pompeii’s roughly 11,000 inhabitants were killed instantly, as hot surges as high as 482 °F swept across the land at a distance of six miles from the volcano. The city itself was showered with 25 meters ash for more than six hours, preserving Pompeii forever. Because of its unfortunate demise, Pompeii offers archaeologists, researchers, and tourists a unique snapshot into ancient Roman life during the Pax Romana (“Roman Peace”). The objects buried along with the city in 79 AD have been well-preserved for centuries due to their lack of exposure to both air and moisture. Pompeii, which is part of a larger Vesuvius National Park, was declared a World Heritage Site by UNESCO in 1997. AESU, the most trusted name in travel, offers unique, exciting travel programs for college students and young professionals at affordable rates. Each trip is action-packed and informal—designed just for people your own age. We offer several discount Italian vacation packages, including several that visit the city of Pompeii: Great Escape and Explorer packages. Expand your horizons in great places with great people and discover yourself in the process! If you have any questions about Pompeii or any of our Discount Italian Vacations, please contact AESU by calling 800-638-7640 or fill out the contact form found on our website. And don’t forget to check out all of our great Travel Tips, especially the Travel Tips for Europe, before you head overseas. This entry was posted on Thursday, August 21st, 2014	at 3:46 pm	. You can follow any responses to this entry through the RSS 2.0	feed. Both comments and pings are currently closed.